If you have already received your account credentials you can begin registering for activities online! Click the "View Activities" button below. Disclaimer: Programs are seasonal and while they may be displayed, are only available for registration during certain times of the year. To begin registering for programs online, you will need to request an account and password. 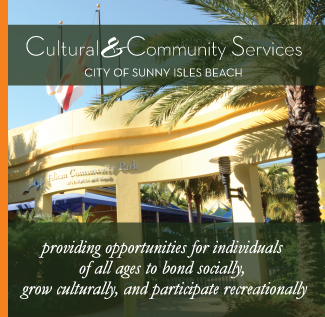 If you or a family member have participated in a Sunny Isles Beach program in the past, already have a valid City-issued SIB Resident ID card, or have a membership at Pelican Community Park, you are already in our system. To request your account and password, call 305.792.1706 and let the office assistant know that you would like to obtain your online account for activities registration. Please be ready to provide the office assistant with your name, birth date and e-mail address so that they can locate and verify your account. Once your account has been verified, an e-mail will be sent to you with your login information. New to Sunny Isles Beach Programs? If you have never participated in a Sunny Isles Beach program, don't have a valid City-issued Sunny Isles Beach Resident ID card, or do not have a membership at Pelican Community Park, you will need to register with us before you can obtain your online account. Are you a Sunny Isles Beach resident? If you are a Sunny Isles Beach resident, you will need to obtain your valid City-issued Resident ID Card to receive the discounted price and priority registration. After your application is approved, you will receive an e-mail with your account login information for online registration. *Please allow 5-7 days to receive notice of SIB Resident ID card approval and 1-3 days to receive your account credentials via e-mail. Not a resident? If you are not a Sunny Isles Beach resident, you will need to fill out the non-resident account request form. Once your form has been submitted, you will receive an e-mail with your account login information for online registration. Please allow 1-3 days to receive your account credentials via e-mail. Pelican Community Park, 18115 North Bay Rd.